Derik LeCaptain torched defenses for 92 touchdowns in his Southern Door career. Photos by Len Villano. Derik LeCaptain wrote his name all over the Southern Door High School football record books this season, but when you talk to those who coached him, it’s not the numbers that come up first, but character. Coaches are supposed to say nice things about their own players, but consider the response from Sturgeon Bay coach Jim Adams. If any coach would have some animosity toward LeCaptain it would be Adams, whose team LeCaptain torched for 245 rushing yards and three touchdowns in a 55-0 victory in October. LeCaptain’s statistical accomplishments are nothing to laugh at. The 6-foot-2, 230-pound running back and linebacker punctuated his career this fall by rushing for 2,019 yards and 22 touchdowns, and added 22 receptions for 492 yards and 6 touchdowns. Defensively, LeCaptain made 98 tackles – including 68 solo stops – and had four interceptions, two of which he returned for scores. That was more than enough to earn him the offensive and defensive player of the year award for the Packerland Conference, a year after winning the offensive award in 2017. “His impact in every game he played in was evident not only by the stat line, but by the obvious preparation opposing teams would put into stopping him,” Zuehlke said. Stopping LeCaptain is something few teams could do the last four years. His career stats include 5,073 rushing yards and 65 touchdowns, and 98 receptions for 1,840 yards and 23 touchdowns. LeCaptain recorded 209 tackles, including 146 solo stops, and returned four of his nine interceptions for a touchdown. His 92 total touchdowns broke the school record of 88 held by Ryan Englebert. LeCaptain was a toddler when McCarty first met him, and a few years later he was begging McCarty to let him play for the Kolberg Kougers, the youth football team McCarty coached with LeCaptain’s father, Mark. The Kougars team was made up of third, fourth, and fifth graders. McCarty said LeCaptain, a first grader at the time, was allowed to practice with the Kougars but couldn’t dress for games. Playing against older boys wasn’t new for LeCaptain. He grew up playing with his brother Nick, two years his elder, who was also a standout athlete at Southern Door. Derik LeCaptain earned player of the year honors on offense and defense. Photo by Len Villano. Youth wasn’t an issue when LeCaptain arrived at SDHS his freshman year. He started the season as a slot receiver, a 20-14 loss to Winneconne in the opener. McCarty and his staff decided to move LeCaptain to tailback the next week. LeCaptain rewarded them with 825 rushing yards and 13 scores on the season, plus 11 catches for 289 yards and four touchdowns on his way to being named first team all-conference for the 10-2 Eagles. LeCaptain recorded 1,847 total yards and 22 touchdowns as a sophomore, then 1,441 and 25 touchdowns as a junior, when his legend was cemented late in the season. Despite nursing an ankle injury, he was called upon to fill in for injured quarterback Kyle Daoust against Coleman. A win would clinch the Eagles’ third consecutive league title. LeCaptain completed 11 of 21 passes for 160 and three touchdowns. He also carried the ball 34 times for 124 yards and a score as the Eagles defeated Coleman 27-14. LeCaptain’s senior campaign got off to a slow start on the ground against Winneconne when he was held to just 15 yards on 9 carries, but that was the last time he was slowed. 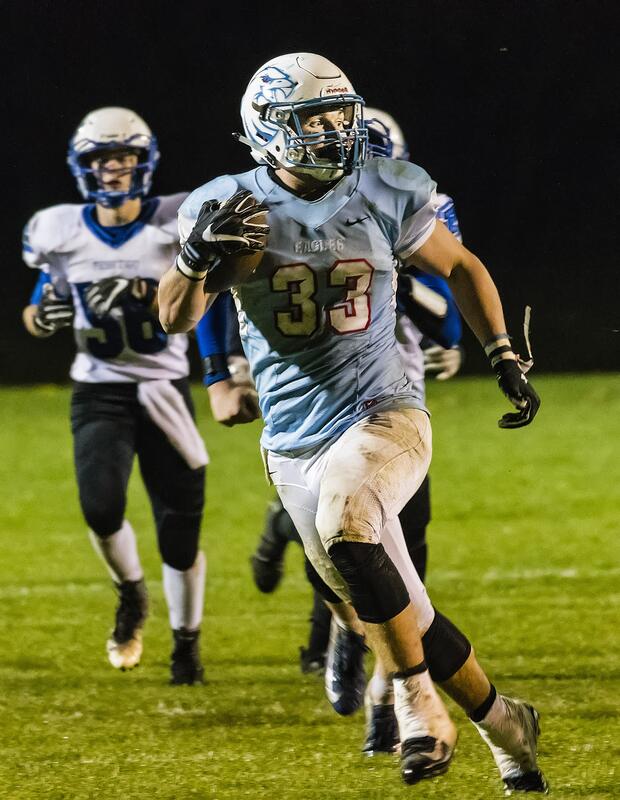 Against Wausau East in week two he piled up 262 yards and three touchdowns, including an 84-yard scoring run late in the fourth quarter that sealed a 20-14 win. He went on to eclipse the 200-yard mark five more times, highlighted by a 326-yard, four touchdown performance against Peshtigo. Southern Door finished 5-1, one game behind Kewaunee, who defeated the Eagles 41-12 during the regular season. The Eagles opened the postseason with a 55-15 win against Peshtigo behind four LeCaptain touchdowns. Round two brought a rematch with Kewaunee, but a late Eagles rally fell short, ending one of the great prep football careers in Door County history. LeCaptain is nearing a decision on his next step. 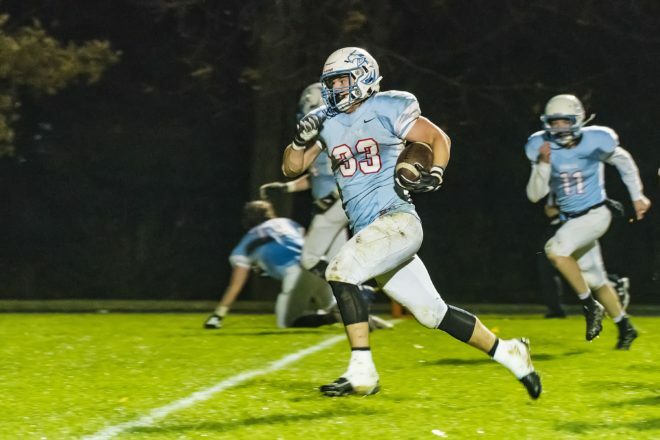 The University of Wisconsin has offered him a preferred walk-on spot for next year, which allows him an opportunity to earn a spot on the roster despite not receiving a scholarship. Iowa State, Minnesota and Iowa all have shown interest. Perennial NCAA Division II power North Dakota State has reached out, as well as Minnesota State University Mankato. For all the potential his future holds, LeCaptain remains happy to soak in the present at Southern Door.